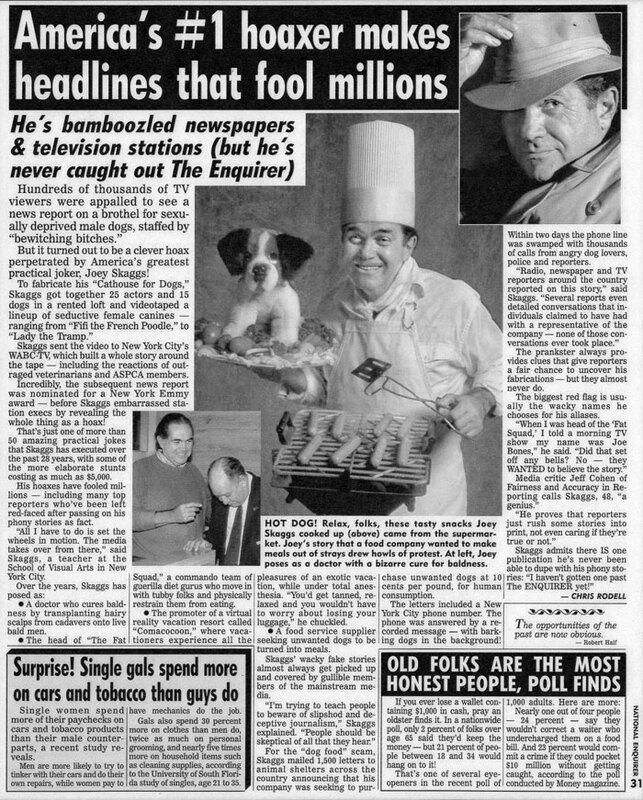 After The New York Times Magazine published John Tierney’s article, Falling For It, about Joey Skaggs’ Dog Meat Soup hoax, the National Enquirer called Skaggs and told him they were doing a profile about him. They wanted an exclusive photo shoot. They had covered Skaggs numerous times before (1984, “Clown Prince of Headlines” about both his Cockroach Vitamin hoax and his Windsurfing hoax, plus “Swank Fish Tank” about his Fish Condos; and 1986, “Hoaxer Tricks U.S. News Giants With Phony Fat Squad Story – But He Couldn’t Fool Enquirer“). Not being a fan of this particular publication, he declined. He told them they already had enough photos of him on file. But they insisted. Skaggs was in Hawaii, where he lived part time. When he told them this, they didn’t believe him because they had called his New York number. Skaggs always had his New York phone forwarded to Hawaii so no one ever knew exactly where he was. After allowing them to call his Hawaii phone number, they believed him and hired a local photographer to take his picture. Skaggs knew the photographer and made arrangements to submit a photo of someone else to the National Enquirer. The someone else was Skaggs’ friend Peter Insalaco from New York, who happened to be on vacation in Hawaii at the time. 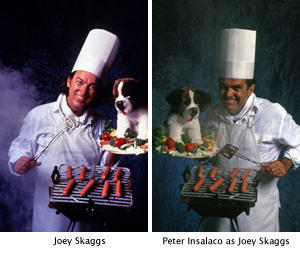 The photographer, in on the hoax, shot both Skaggs and Insalaco posing in the exact same set-up. They each wore a chef’s hat and held a silver platter with a stuffed dog surrounded by vegetables while turning hot dogs on a barbecue grill. Upon receiving the photo of Insalaco, the National Enquirer said they couldn’t use it and wanted to reshoot. They felt the image would be offensive to their readers. They preferred to have him standing outside a chain link fence of a dog kennel. As if that would be less offensive! Skaggs, by now on his way back to New York, told them he was not available, the real reason being that Insalaco was still on vacation in Hawaii. But the National Enquirer persisted. They waited impatiently for Skaggs to be available. When Insalaco returned to New York, Skaggs agreed to a second photo shoot at a photographer’s loft in Manhattan. As luck would have it (possibly bad luck in this case), Skaggs also knew this photographer. He had photographed Skaggs previously for The Boston Globe when he said he was Dr. Chenango, the native American scalp transplant surgeon, for his Hair Today, Ltd. hoax. The second photo shoot went off without a hitch. 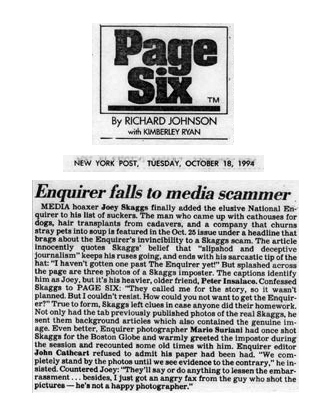 The photographer did not realize the person he was photographing was not Joey Skaggs and he submitted his photos to the National Enquirer. Unfortunately for the Enquirer, they hadn’t checked their own photo files to verify Skaggs’ identity. 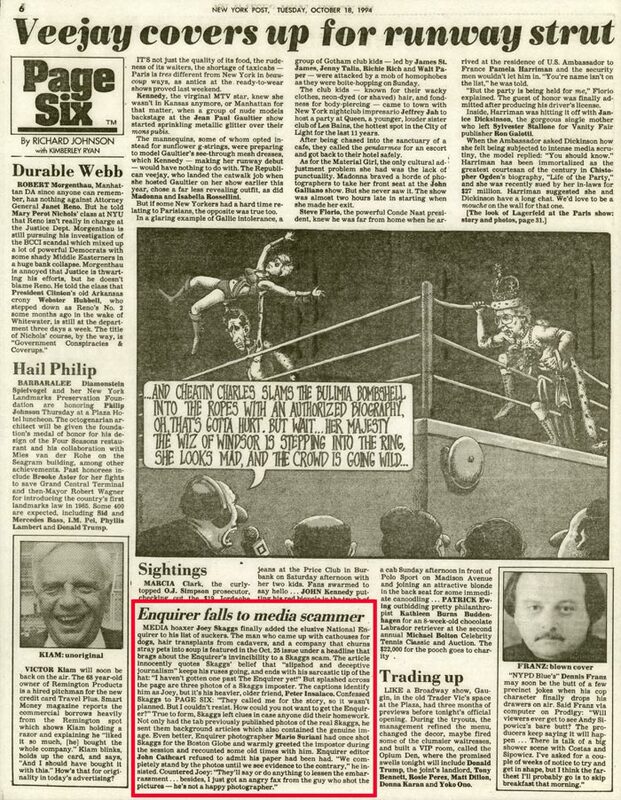 Even though the hoax was revealed in Page Six of the New York Post, the National Enquirer did not believe they had been fooled. How was it possible Skaggs could have the same impostor in two different places photographed by two photographers who both said they knew him?